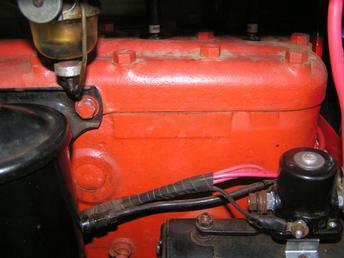 The s/N should be stamped just to the right of the oil filter on the engine block. Might hafta scrape around that flat area. Sometimes the number is filled with paint and or engine grease. The overflow pipe is where the water is coming out of. Lots of times the radiator system is finding its "LEVEL" when just services with too much coolant. I think that number that you listed may be the part number for the block. Hmmm. How much fluid did you put in the radiator? You should only put in enough to cover the inside fins in the radiator. The thermostat you put in is it in the upper hose (the higher one) with the pointy side pointing to the radiator? This is a picture of where the serial number is found. Left side of engine center of this picture is a flat rectangle, this is where you will find the serial number. when replacing the thermostat...make sure the spring part is facing the engine or you are asking for trouble. thank you so much for all your replies, guys..
yep, I think I filled the radiator too full... I filled it all the way to the top. BUT, I figured out that there was no oil in the poor girl.. she was bone dry... (I named her Josephine) I put in 5 quarts. she is not spewing out fluid anymore, but, she seems to run VERY hot.. could be just because it was 90 degrees today? thanks for the tip on the serial number, I can see the plate but it has been painted over, so I will scrape off the paint. You stated that she is "Runn'N Hot".. Maybe you should make sure the radiator fins are clean of dust and dirt. I use the gardon hose to wash'em down, most times.